Ahead of his appearance at the Shanghai International Literary Festival this month, we caught up with Rao Pingru to learn more about his memoir. He'll be presenting a session on March 20 at 12pm. Cover of Our Story (English version). Courtesy of Rao Pingru. The Nanchang-born writer and artist’s turbulent life is documented in detail in his 2013 illustrated autobiography, Our Story: A Memoir of Love and Life in China. 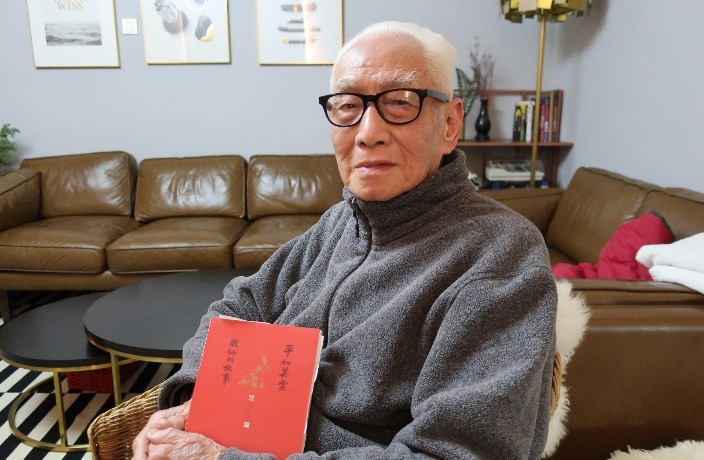 Readers are taken through more than eight decades of time from his birth in 1922, to his life as a young soldier fighting against the Japanese, and later falling in love and starting a family with Mao Meitang when the war ended. After a few good years together, the young couple were separated by the government when Rao was sent to a re-education camp in 1958 due to his previous Kuomintang affiliation, where he spent more than two decades before his eventual return to his family in Shanghai in 1979. The story ends in 2008, when his wife succumbed to her battle with various illnesses that plagued the final stage of her life. Rao Pingru and Mao Meitang's wedding. Illustrated by Rao Pingru. During his free time, Rao began writing down bits and pieces of memories that came to mind at random, and adding illustrations to them. A few months into the process, one of his granddaughters who works as an editor at a publishing house came to visit him at his home. “I showed her one of my most recent paintings at the time – the wedding scene – she took a picture with her phone and posted it on the internet. The internet is very cool; lots of people saw her post!” Rao says of the beginning of an exciting chapter of his life. For the months that followed, Rao was interviewed by various media outlets across the country, and even appeared on a CCTV program that brought his story into the homes of millions of viewers. Subsequently, a Guangxi-based publisher approached him with an offer to turn his words and drawings into a book. In collaboration with his editors, Rao added more content to fill in the gaps of the story, which eventually led to the initial release of Our Story in 2013. Immediately, the feedback was overwhelming. Readers were not only touched by the couple’s sweet, loving moments at the beginning of their courtship and the sadness of his wife’s untimely departure in the end. Seeing their unwavering devotion to one another throughout all these years – even during the toughest challenges life had thrown at them as a result of one of the most turbulent periods in modern Chinese history – was the most captivating part of their journey. The first family portrait after Rao's release. Illustrated by Rao Pingru. After its success in China, Our Story has since been translated into seven other languages, including an English version that came out last May. Back in 2017, Rao’s French publisher invited him to Paris for a publicity tour, where he was interviewed by various media outlets and held several talks about his work. It was on this trip when he realized a bigger lesson from his own story. Rao's last memory of his wife. Illustrated by Rao Pingru. March 20, 12pm, RMB180. Glam, see event listing, buy tickets here. Cover image by Dominic Ngai/That's. Several hundred films will be screened across the city, including Deadpool and Moonlight.